If variety truly is the spice of life, then the clever folks collecting advertising tins have it all figured out. Because when more is merrier and one is never enough, there's colorful tin waiting around every corner. No, the life of a tin collector doesn't revolve around advertising slogans and the associated cliches. But those cleverly marketed products do often pull collectors in one direction or another using bright colors and interesting graphics, and the choices available go way beyond actual spice tins. While there are a number of really good reference books available on advertising tins, most collectors deciding to concentrate solely on older tins eventually gravitate to copies of David Zimmerman's Encyclopedia of Advertising Tins, Vols. I and II to find a wealth of information on the topic. These books are now out of print but are worth the effort to locate via used booksellers. When examining a tin, if it has raised printing Zimmerman notes this technique was commonly used from 1895 to 1900. Paying attention to the type of lithography makes sense as well. 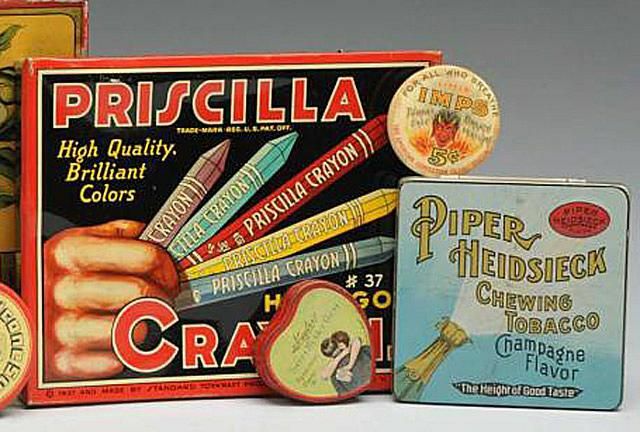 The coloring method used on packaging in the 1890s usually consisted of black and one other color, while four-color lithography wasn't used on tins until around 1930. And, perhaps most interestingly, in 1906 the Food and Drug Administration eliminated the often-entertaining claims of cures and remedies used on packaging. Those miracle cure statements making outrageous claims about products marketed for medicinal purposes are known as "quackery" today. Many collectors of quack medical devices also purchase advertising tins that complement their collections. A couple of other age indicators to keep in mind when examining tins are the original price stickers that may still be in place and addresses printed on the tins. In general, prices rose as time passed, even though the decoration on a tin may not have changed much over the years. Address changes can indicate a company growing larger or smaller. And the use of zip codes on more recent packaging also helps to deduct the age, since zip codes didn't come into play until 1963. When looking for more affordable tins, collectors often turn to those made in the zip code era. That is, those made after 1963 when zip codes started appearing in company addresses printed on tins. Tins made to hold breath mints can be inexpensive options that take up very little display space. There are literally hundreds and hundreds of these little beauties to collect akin to the popular Altoids tins found in stores today. Of course, many budget-conscious collectors are turning to freebies to begin collections. These can include the tins distributed containing AOL compact discs at the dawning of the Internet age in the mid-1990s. There's a book out on the topic and on any given day you can add to an AOL tin collection by visiting online auction sites. Mail-in promotion tins, like recipe boxes, can also be a good option for low-cost collectibles. The mail-ins tend to be priced higher off the bat on the secondary market when compared to those sold in stores and they have a greater potential to rise in value as time passes. Even if you're not into collecting freebies and promos, shopping for all types of tins at flea markets, garage sales and estate auctions will certainly net some bargain buys. For top-notch selections, however, it's wise to keep an eye out for individuals selling off collections and antique shows specializing in advertising memorabilia. Many collectors enjoy combining both old and new tins of the same variety into a collection including popular products still made today like Band-Aid bandages. Numerous mint and tobacco tins fall into this category as well. A perennial favorite with fans of tobacciana is Lucky Strike Merrie Christmas "flat fifties" tins. Collectors use the term flat fifties to describe hinged tins made during the 1940s and '50s that held cigarettes in a single layer and were easily stashed in a jacket pocket or clutch purse. When highlighting favorites in her own collection, former Collectibles Expert Barbara Crews focuses on the reproduction Roly Poly tobacco tins made by Bristol Ware in the 1980s. These tins are decorated to look like human characters. She notes that the original Roly Poly tins were made by the Tin Decorating Company (Tindeco) around 1912 and now sell for $300-650 apiece while the reproductions can be purchased for far less. Watch out for reproduction tins, however. Rusty cans with newly produced paper labels have been spotted. Some of these tins can fool even seasoned collectors so look for telltale signs of newness like modern printing methods and can production.